As we look back on the year and gauge our organization’s global achievements, we look a little deeper than the numbers to evaluate success. Haws has a culture that believes in supporting the community in which it resides. It’s one of our core values – to be a caring organization. This is evident by the various giving activities we participate in throughout the year to engage and help our local regions. H aws has a unique way of participating in local charities. Every two years team members are responsible for nominating and then voting on two charities to support company-wide. For the next two years, each charity receives a $5,000 annual contribution from Haws, and throughout the year we hold numerous unique employee fundraising events to support these charities and add to the Haws corporate donation amount. Did someone say bake sales and chili cont ests? 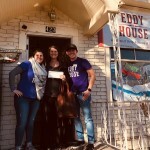 In 2018, we once again supported the Northern Nevada Children’s Cancer Foundation and, for the first time, the team selected local charity, The Eddy House. On top of the corporate $5,000 donations, Haws offers a one-to-one matching program for employees. Through our matching program, we’ve been able to donate an additional $1,000 for each of the two selected charities. And that’s not all! On top of organized giving programs, our employees step up during times of need. This year, many of our Reno employees donated their Haws gift, a holiday grocery voucher, to those who had lost their homes in the Northern California Camp Fire. The vouchers were used to purchase dinners for displaced families. In addition, we hosted a denim and clothing drive for the Reno Rodeo Foundation. It’s clear that there’s no shortage of charitable spirits here, and in 2019 we hope to surpass those numbers as we continue to support The Northern Nevada Children’s Cancer Foundation and The Eddy House! For more information about Haws and our team, please visit us at www.hawsco.com/ourstory .